Give yourself the gift of a beautiful smile, you're worth it. We provide exceptional dental care for your entire family. We've spent over 30 years honing our skills, perfecting our techniques, and following the latest trends in technology, so we can better serve our patients. From our state-of-the-art Miamisburg, OH dental office, we offer comprehensive general dentistry and cosmetic dentistry, including periodontal therapy, conventional braces, Invisalign clear braces, and dental implants. Your family can rely on us for quality dental care that puts your goals and priorities first. Dr. Striebel and our team strive for perfection in everything we do. We’re devoted to your comfort, so we use gentle, conservative techniques and never rush through your appointments. With advanced technology like CEREC® and years’ worth of continuing education, we offer a wide range of contemporary solutions that will allow you to maintain a healthy, beautiful smile throughout your lifetime. Our office, conveniently located in Miamisburg, features free Wi-Fi access, TVs in every operatory, the latest dental technology, and wide open spaces. 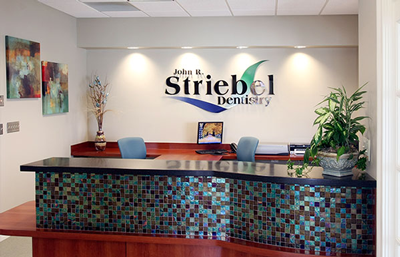 Dr. Striebel and our team have created an atmosphere where you can relax and receive dental treatments catered to your unique needs and desires. Call our Miamisburg office today to reserve your appointment with Dr. Striebel. From our conveniently located Miamisburg, OH dental office, we serve patients from Miamisburg, Springboro, Centerville, West Carrollton, and Miami Township. We look forward to making you smile!